Barbara's concept of a "Journey To Excellence" applies for each individual horse and rider team and is the cornerstone of Barbara Strawson, LLC. Barbara cares about your goals and wants to help you achieve them. Barbara is currently active as a top-level dressage competitor and believes that dedication to excellence is the clearest pathway towards seeing goals accomplished. 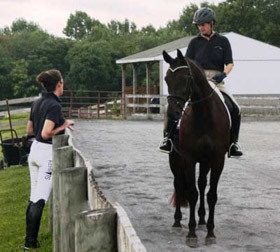 Before engaging in a training agreement, Barbara evaluates both horse and rider. Together they discuss and document realistic goals and a timeframe for achieving them. Specific services include training of the horse, training horse/rider teams, show preparation and campaigning, and preparing horses for sale. Barbara works with each client, insuring that each individual is working towards their goals. She communicates with warmth and dedication. Barbara gives attention to rider position, helps the client understand horse and rider body mechanics (both together and as individuals) and brings a thorough understanding of the sport through her own experience at the highest levels. Barbara’s own dedication to excellence, attention to detail and thorough commitment to the well-being of the horse throughout the training process is the model by which clients can flourish. The Team Strawson approach fosters a collegial but individualized environment where horse/rider teams advance efficiently up the dressage levels, to achieve their goals. Barbara provides full-time training and show campaigning through FEI Grand Prix, and customized training programs based on the unique needs of clients and their horses. Training occurs at Barbara's farm, Misty Gleann. Private sessions accelerate learning with a focused approach to classical training and progression through the levels. Barbara also travels to The Stables of Rolling Ridge and other local farms where she provides customized training programs or lessons. Occasionally, Barbara offers her own or client-owned horses for sale. When offered, horses for sale will be listed here. Barbara and her team regularly contribute their time and talents to community events. Learn more about the most current community events, courtesy of Team Strawson.